Your SumTotal news page can be more than static content and links. You can transform it into a learning center that will motivate and engage your learners. Let your users track their progress with a customized learning dashboard. Display achievement badges when they reach important milestones. Bring the most important activities to the front page so your learners will know what’s important right now. 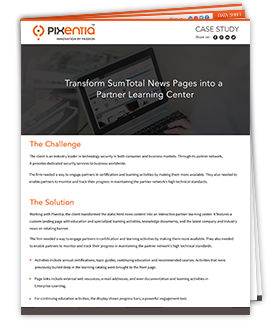 Download our case study on title "Transform Sumtotal News Pages into a Partner Learning Center" to learn how a global technology security company created a Partner Learning Center right in its SumTotal news page. See how you can customize your news page to increase the power and value of your SumTotal LMS.